Despite their impressive outward appearance, the French ships simply had no experience of operating in such a large fleet in wartime. Even before d’Estrées arrived at Spithead, King Charles II himself, at a meeting of the Committee for Foreign Affairs, expressed the view that the Duke of York should ‘ripen the Fr[ench] in passage and rules of sailing and fighting etc before they fall in with the Dutch’, adding that it would be better if the French were not committed to battle too soon. After the juncture of the fleets, the French were regularly found guilty of manoeuvring and sailing errors by experienced British officers, whose comments ranged from the sympathetic to the caustic. Only time could have righted these problems, and the Dutch were well aware of this; after all, they had their own experience of undertaking combined operations with the French during 1666-7. Moreover, the Dutch urgently needed to upset the seemingly inexorable progress of the Anglo-French ‘grand design’ and its war machine. By the end of May 1672, the United Provinces were in dire straits. Maaseik had fallen, Orsoy, Rheinberg and Burick were all under attack, and the main French armies under Marshal Turenne and Louis XIV himself were at Cleves, on course to accomplish the hugely symbolic (and, for the Dutch, strategically disastrous) feat of crossing the Rhine on 2 June. Meanwhile, the allied armies of Cologne and Munster were pouring across the eastern border into Overijssel and laying siege to Groningen. In the midst of this desperate crisis, Michiel De Ruyter took his fleet to sea. With him went Cornelis De Witt, political representative of his brother Johan and the States-General, who sat calmly in a velvet-covered armchair on the quarterdeck of the flagship De Zeven Provincien as battle raged around him. De Ruyter had already made an abortive attempt to engage before the juncture of the two allied fleets, and when he learned on 27 May that the combined fleet was moored in Sole Bay to take on provisions (it had arrived there on the twenty-third), he immediately ordered his fleet to attack, taking the allies by surprise in the early hours of the twenty-eighth. At three that morning, the master of the victualling ship Friendship saw an incoming scout raise the alarm by letting her topgallant sails fly loose and firing her guns. The combined fleet was moored parallel to the shore in its squadrons and divisions: the French squadron, forming the van, was the most southerly and westerly, with Duquesne’s division the southernmost of all, while the earl of Sandwich’s blue squadron lay to the north and east of James’s red squadron. The wind was from the east-south-east, the Dutch approaching from the north-east. What happened next was to be the most controversial aspect of the battle, and the cause of both contemporary and later criticism of the conduct of the French. While both the blue and red squadrons got underway to the north on the starboard tack, thereby reversing the order of the fleet, d’Estrées got underway to the south on the port tack. The spectacle of the French fleet going in the opposite direction to its British allies was the origin of the charge that the French had deliberately deserted the rest of the combined fleet. 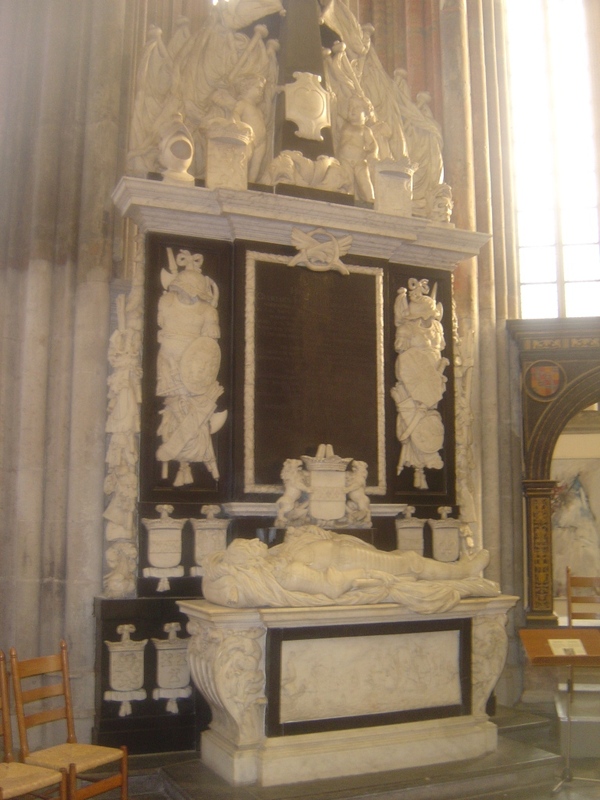 In fact, the French put up a good fight against Adrian Banckert’s Zeeland squadron, which was detached to engage them: up to 450 French mariners were killed, among them des Rabesnières, one of the architects of the naval alliance, who was subsequently honoured with a spectacular funeral in the choir of Rochester Cathedral. This heavily publicised and deeply symbolic act was as much a tribute to the dead officer’s Protestant faith as to his gallantry, and perhaps was also intended to reconcile those who saw it or read about it in their newsletters or Gazettes to what was already an unpopular alliance with a Catholic power. While the French fought and died to the south, the British fleet was hotly engaged to the north. The light winds ensured that the whole scene was soon shrouded in smoke, adding to the confusion and making it difficult to identify misconduct. The flagship Prince was under sail by 5.30 (no small achievement, as she had been heeled over to careen only two hours before) and by eight was engaged with the Dutch. De Ruyter personally targeted the Prince; although she was easily identifiable to the trained eye, the huge royal standard at her main made her unmistakable. De Ruyter now delivered one of the laconic bon mots for which he was famous. Turning to his helmsman, he said ‘Mate Zeger, that’s our man’. Zeger replied ‘Sir, that’s what shall happen’. The Prince was soon under fire from seven ships and could obtain no relief from her seconds, which were becalmed. The Duke of York ignored the risks to the life of the heir to the throne, striding across the deck to encourage the men and ordering the helmsman to edge ever closer to the enemy. Several of his retinue were cut down on either side of him, but the duke bore a charmed life. The new acting captain of the Prince, John Narbrough, was impressed: ‘no prince upon the whole earth can compare with his Royal Highness in gallant resolution in fighting his enemy…he is general, soldier, pilot, master, seaman; to say all, he is everything that man can be, and most pleasant when the great shot are thundering about his ears’. By midday the Prince was effectively disabled, her main topmast shot away and her mainsail rendered useless by the fallen mast. With Dutch fireships bearing down for the kill, Narbrough ordered the ship’s boats to tow her to safety, and James shifted his flag to the St Michael; when that ship in turn became shattered, he moved to the London. Other ships were in almost as bad a state. The Resolution had seven feet of water in the hold and had to drop of the line. The Royal Katherine was taken by the Dutch, then retaken shortly afterwards when some of her gunners managed to overpower the Dutch prize crew; even so her captain Sir John Chicheley, who was also the squadron’s rear-admiral, had already been taken off and was on his way to captivity in Holland. The Red squadron fought on until about eight in the evening, when the two fleets finally parted. 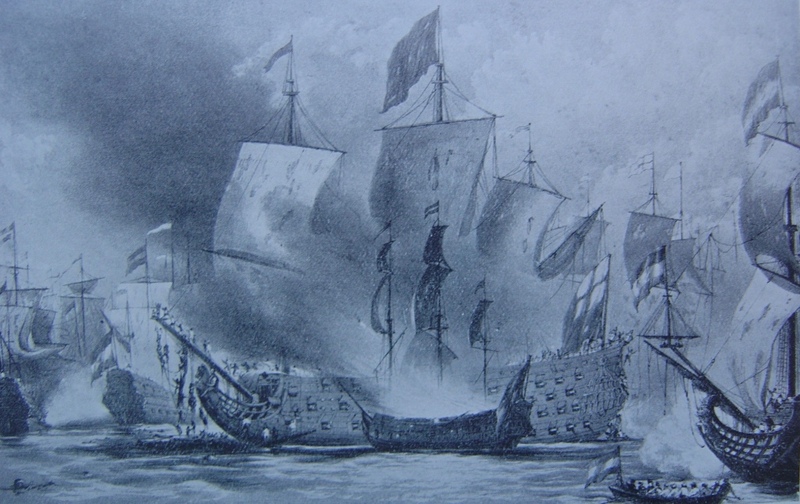 The main force of the Dutch attack had been directed against the squadron nearest to them, the Blue, and especially against Sandwich’s flagship, the brand new 100-gun First Rate Royal James. The Blue had little time to organise itself into a line of battle, and the Royal James was soon isolated. Immobilised by Jan Van Brakel’s Groot Hollandia, which became entangled in her bow cables and rigging, Sandwich’s ship was subjected to a devastating bombardment by Van Ghent’s flagship Dolfijn. An order for Jordan and his division to come up to her assistance was deliberately ignored; at least, that was the interpretation placed on events by Richard Haddock, Sandwich’s flag captain, who recorded how Jordan ‘passed by us to windward very unkindly…and took no notice at all of us’. Jordan’s own account of the action effectively ignored the issue, concentrating instead on how his Sovereign and the rest of his division had fought all day (or so he claimed) against eight or nine large Dutch ships. Meanwhile Charles Wylde, captain of the Bristol in the Red squadron, had tacked at noon and fought to the south-eastward for two hours, ‘having a hot and bloody fight without any cessation, and so kept on, they having the wind to our great disadvantage’. At about two, the Bristol passed to leeward of the Royal James and saw the great ship on fire. She had been attacked by three fireships, one of which, the Vrede under Captain Jan Daniëlszoon van den Rijn, had been secured to her port quarter and successfully ignited. With many of her men already dead or wounded (including her flag captain, Haddock, who had been shot in the foot) the Royal James no longer had the resources to fight off the attack or to put out the flames. By four, when the hastily repaired Prince came up, the Royal James was burned out. The fate of Sandwich was a mystery until his bloated body, recognisable only by the Garter ribbon that he still wore, was fished out of the sea on 10 June, thirty miles from the grave of the Royal James. Wylde of the Bristol, who clearly wrote up his ship’s log contemporaneously, prayed ‘the Lord grant his Royal Highness his life and our fleet better success…God in mercy continue our general and all our courages, and hope to ring them [the Dutch] a better peal than ever they heard, this being not inferior to any [battle] before’. Wylde was entirely justified in praying for the Duke of York’s safety, for the hammering of the flagships inevitably led to a shocking attrition rate. 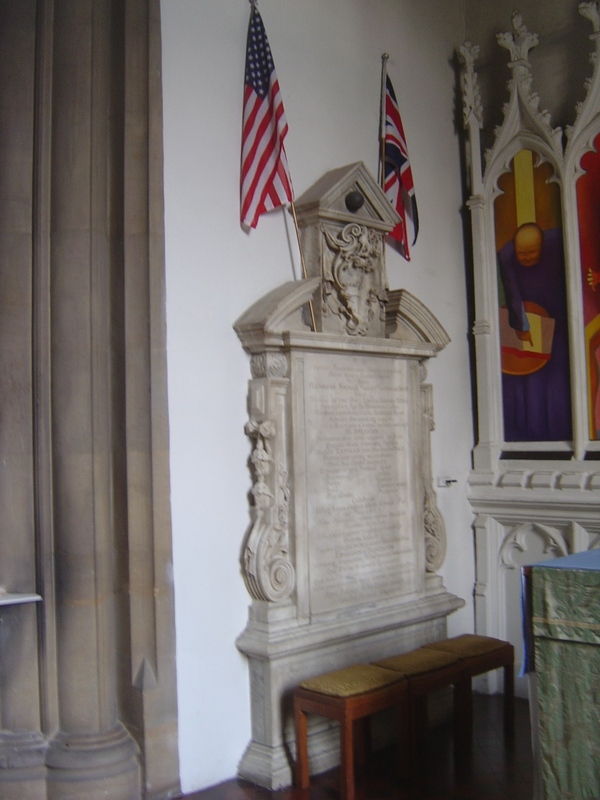 In addition to Sandwich, the recently knighted Sir John Cox, the Duke of York’s flag captain on the Prince, was killed by a cannonball, while Sandwich’s opposite number, Van Ghent (who was killed by canister shot that shattered his torso and left leg) became the only senior Dutch officer who fell; he is commemorated by a large memorial in the Domkerk at Utrecht. As well as Cox and the Frenchmen Les Rabesnieres and Des Ardents, five English captains were killed, the most notable being Francis Digby, son of the Earl of Bristol and one of the chief architects of the combined fleet, and Sir Frescheville Holles, the charismatic and swashbuckling one-armed cavalier who had clashed more than once with the rather more prim Samuel Pepys. One of the lieutenants who fell was the twenty-one-year-old Winston Churchill of the Fairfax; his elder brother John, who was attending the Duke of York aboard the Prince, survived the battle, and went on to command in many more glorious and successful engagements. Charles Harbord, son of the king’s Surveyor-General, and Charles Cottrell, son of his Master of Ceremonies, perished with Sandwich on the Royal James; last Thursday I was at a superb concert in Westminster Abbey, and from my seat in the nave I could see the grand memorial erected to the memory of the two young friends by Harbord’s father. Also among the dead was Colonel Richard Nicholls, another member of the Duke of York’s retinue, who had once played a not insignificant part in rewriting world history. In 1664 Nicholls had commanded the expedition that overran the small Dutch colony of New Amsterdam, at the southern tip of a long and densely forested island off the American coast, and renamed it New York in honour of his patron. 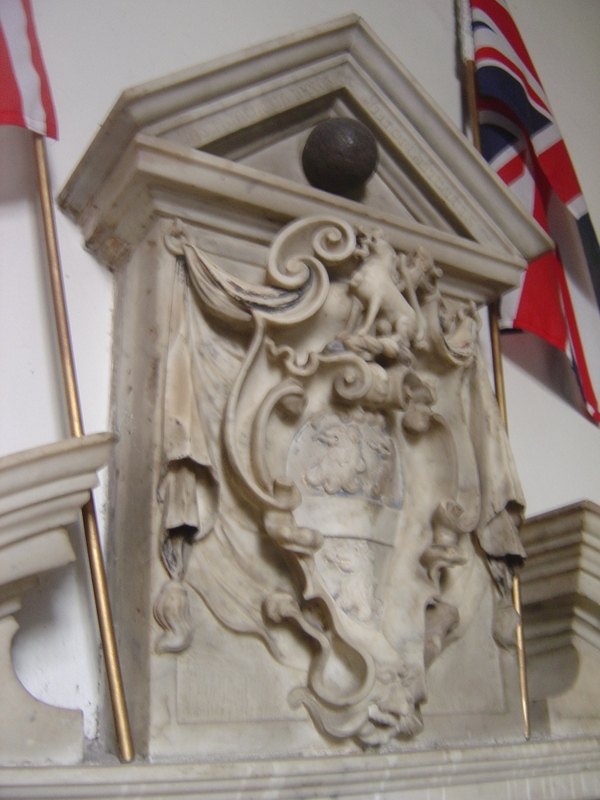 Nicholls’ body was taken back to his home town of Ampthill in Bedfordshire and interred beneath a monument capped by the Dutch cannonball that had killed him. On the lower deck, men perished in their hundreds. Sandwich’s lieutenant, held as a prisoner on De Zeven Provincien, was appalled by the casualties at Solebay, telling De Ruyter that more had died by the afternoon than in all four days of the great battle of 1-4 June 1666. Over a thousand British sailors were killed (and almost half as many again died in the French squadron), including perhaps half of the crew of the Royal James; a contemporary Dutch list suggests that some 528 of their sailors perished. As usual in seventeenth century warfare, the flagships bore the brunt. The losses on the Royal James were exceptional and amply demonstrated the devastating consequences of a successful fireship attack (which were mercifully rare), but the other British flagship, the Prince, had about a hundred killed and wounded; however, the French Ruby, the last ship in the rear-admiral of the Blue’s division, had only three killed and four wounded. Similarly De Ruyter’s flagship Zeven Provincien had twenty-eight killed, a figure exceeded by only one ship in the Dutch fleet. Each bare statistic conceals individual tragedies. The deaths of just four ordinary seamen on the Victory left no fewer than twenty-one children fatherless in Midland villages far from the sea. William Williamson, boatswain of the St George, died of wounds received in the battle, leaving a widow and six children at Rochester. Soldiers fell alongside mariners. Thomas King of Charlton-in-Craven, Yorkshire, died aboard the Advice, Edward Bevan of Pembridge, Herefordshire, aboard the Royal James. Inevitably, some sought to exploit the relatively generous provision of royal rewards for the families of dead and wounded men: Daniel Vincent, ordinary seaman aboard the Victory at Solebay, who claimed that he had a wife and six children, was actually an unmarried man. Even officers jumped on the bandwagon. John Tooley, lieutenant of the Third Rate Edgar (who claimed to have six children when he actually had only two), the commander of a sloop and the captain of an infantry company were all on a list of 117 names that an Admiralty clerk triumphantly titled ‘The Cheates Discovered’. On the day after the battle, 29 May, James summoned a council of his flag officers and decided to renew the engagement. After all, the date was auspicious: it was both the birthday of his brother the king and the anniversary of the Stuart Restoration, so the imperatives to re-engage and to win were particularly strong. The ‘bloody flag’ of defiance – the red flag at the main, the signal to engage – was hoisted, accompanied by ‘three shouts for joy, to see it flying and we so near the enemy’. According to Charles Wylde of the Bristol, James intended ‘by the assistance of the Almighty to have rung them [the Dutch] such a peal and played them such a game that they might have had occasion to have remembered all the Whitsuntides hereafter’. The planned attack was thwarted by the onset of both ‘a dark and thick fog’ and a gale so strong that it was impossible to run out the lower tier of guns on the flagship; night was also drawing on, and although the Dutch fleet was only half a mile away, the pursuit was abandoned. The strange weather of the twenty-ninth was the precursor of a particularly shocking summer, even by the standards of the ‘Little Ice Age’. By the beginning of August, one of the Scots serving in the fleet (and who thus presumably had long personal experience of dire weather) could write to his country’s Lord Admiral, the Duke of Richmond and Lennox, that ‘we have had a very tedious summer of it, never fleet having endured so much foul weather’. A week later, another of the duke’s correspondents reported to him that ‘the Dutch had traffic with their confederate the Old Gentleman (= Satan) in this affair, for nothing ever came so opportunely as these late storms for them’, while a third claimed that there had not been ‘three fair days together this ten weeks’. These comments are borne out by the objective evidence of the weather entries in ships’ logs and reports from both the fleet and coastal towns, all of which tell a sorry tale of violent storms alternating with dense fogs; as John Narbrough, the duke of York’s flag captain, put it on 27 July, ‘never such weather known in these seas at this time of year before now’. The damage to the fleet was so great that it withdrew to effect repairs, first at Bridlington Bay – where it spent much of August – and then to the Buoy of the Nore, where it arrived on the twenty-third, effectively ending the year’s campaign.